We made a late morning decision to stay home rather than fight the Mother’s Day crowds at restaurants today. That saved a couple of chairs for lucky Mom’s out there! 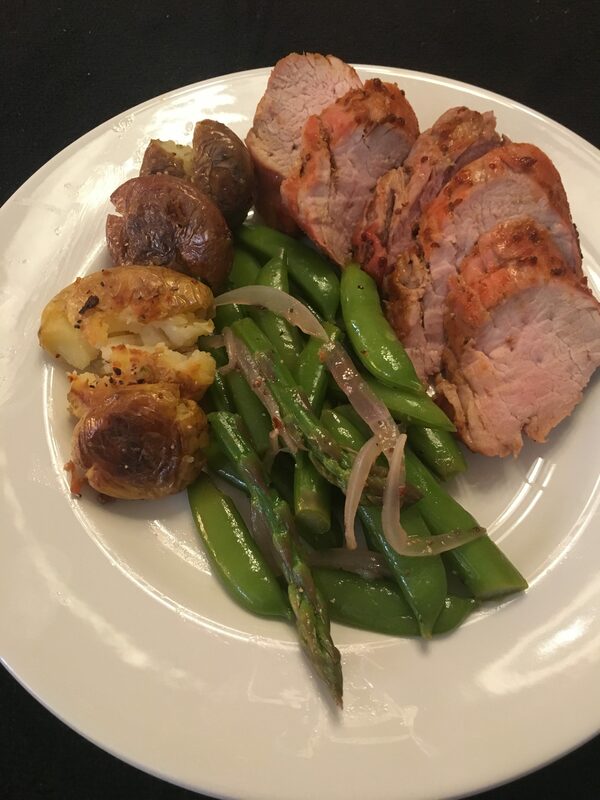 I had some ideas for putting together a late started meal that would look better planned, so I rushed off to the store for pork tenderloins, baby white potatoes and asparagus. Luckily for me, one of the stores had sugar snap peas, so I was able make a spring vegetable salad side dish. The potatoes became crispy smashed potatoes, an idea lifted from last night’s dinner. I didn’t have a recipes for this meal, so I played around and came up with some good stuff! Spring vegetables: asparagus, sugar snap peas, red onion boiled together for about 5 minutes until tender/crisp and bright green, then plunged into an ice bath, cooled, strained and patted dry. They were dressed with . red wine vinegar, salt and pepper and drizzled with olive oil. Crispy Smashed Potatoes: baby red and white potatoes tossed with olive oil and salt and roasted in a 425º oven until done enough to pierce with a fork. Take about 30 minutes. Halfway through, turn and make sure they are still covered with olive oil. When you can pierce them, gently press them with a potato masher to flatten them to about a half inch high. Make sure the are still covered with olive oil. Return to the oven for about 10 minutes, turn them and give them another 20 minutes too get good and crisp. Remove from oven and let coo. Pork Tenderloin with Mustard Sauce: I used a pack of two tenderloins so I’d have left overs. Increase the oven temp to 450º. Remove silver skin from the tenderloins carefully. Tuck thin end under tip for even cooking. I combined smooth Dijon mustard, whole grain Dijon mustard, red wine vinegar and brown sugar adjusting ingredient volume one at a time until it tasted good. At a the end, I stirred in some smoked paprika for color and a hint of smokey flavor. The tenderloins were basted well and put on a rack in a foil-lined baking pan popped them in the oven. At 15 minutes, I checked their internal temperature with a meet thermometer, turnned them over and basted the underside. Back in the oven for 20 minutes, another temperature check, a last turned over and light brush with olive oil to encourage browning. Back in the oven for 8 minutes. One last temperature check and they had reached 145º. Out of the oven and on to a platter, tented with foil to rest for five minutes. The salad and potatoes were carefully tossed, then plated. I pulled the now dressed potatoes out and made the plating you see above. Don’t be afraid to experiment with ingredients you know go together to do something like the mustard sauce. Mix the sugar and mustards and use the vinegar for balance and to thin the sauce a little. It took some time to prep and cook, but it so worth the effort. This plate is two servings. I slipped a small steak on my plate to go with it. My Master Gardener good neighbor brought me a bag of grape tomatoes and green tomatoes that will ripen in a few days. Coincidentally, I had been looking at this tomato salad in the new issue of Sunset Magazine. Of course I had to give it a try. Red, green and yellow tomatoes were cut in slices, wedges and halves to make it interesting. Some slivers of red onion gave it a gentle bite and oven roasted, smashed baby potatoes set it off well. Those potatoes are destined to be a house favorite. You can see a little of the base of creamy feta made by blending feta with buttermilk to get the desired creamy consistency. A touch of sumac was just the right touch. Prep and cook 1-1/2 hours and worth it! Preheat oven to 425°. Scrub and dry potatoes and heap on a rimmed baking sheet. Sprinkle with ½ tsp. salt and pour on ½ cup olive oil. Turn to coat well and spread in an even layer and roast until crisp – 25-30 minutes. Turn every 10 minutes or so to be sure they are evenly coated with oil. Remove potatoes from oven and test with a fork, when soft enough to pierce, press with a potato masher to flatten them. If needed season lightly with salt and drizzle with more oil, if needed. Return to oven and roast until browned and very crisp – another 20–25 minutes, turning over halfway through. Set aside to cool. While potatoes roast, make the feta sauce. In a food processor, blend feta a few seconds to break it down. With blade spinning, slowly add buttermilk to make the sauce thick and smooth as crème fraiche. Scrape sides and bottom of processor with a rubber spatula if necessary and blend just until smooth. Blend in sumac. Add salt and pepper to taste. 1/1/4 heirloom tomatoes cut into wedges and/or thick slices. 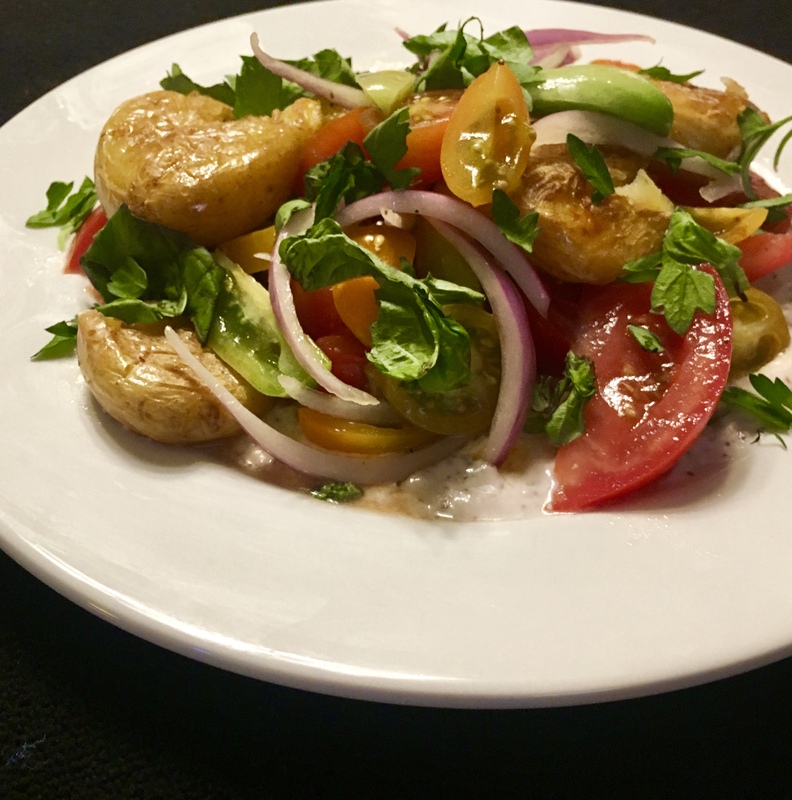 Assemble salad: In a large bowl, toss tomato pieces, red onion, red onion and crispy potatoes (include any oil left in pan) with vinegar. Season with salt and pepper, to taste. Spread feta sauce on a large serving platter and arrange tomato and potato mixture on top. Shingle in herbs and finish with a drizzle of oil. 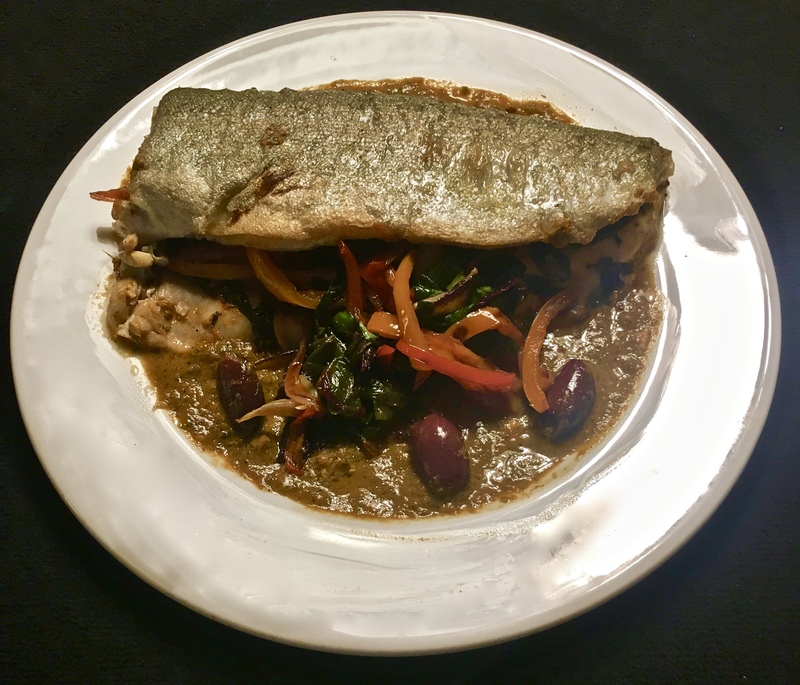 Boned trout… there’s a first time for everything! Do you ever become the victim of a dramatic magazine photo and a beguiling recipe? I consider finding a show-stopper a challenge so I have a throw-down between the magazine and me! Usually with good results. Chard-Stuffed Trout With Charred Tomato Vinaigrette. The magazine photo challenged me! 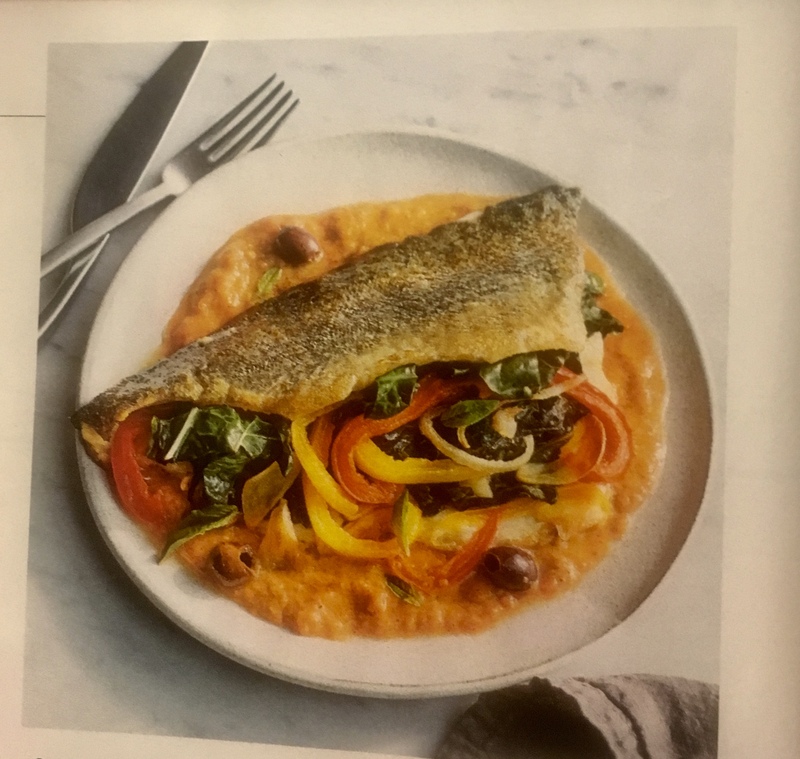 The beguiling recipe called for butterflied boned trout. In visiting two markets, I found whole trout, heads and tails intact, and not boned. The other choice was flat filets. I thought and asked myself, how hard could it be? I didn’t know what to do with the heads and tails at home, so my fishmonger removed them for me. He’s better equipped to dispose of trimmings like that than I.
I took the trout home and searched for a boning video. YouTube has several and all are pretty much the same. It was helpful to watch the video chef make a slice on either side of the spine and gently cut under it to remove it from head end to tail end. She then carefully slipped her knife under the rib bones and cut a paper thin slice of flesh under them and carefully used the blade of the knife to lift them out. Kitchen tweezers helped remove a few pin bones that were left. That maneuver was repeated on the other side. I was able to remove the spine just fine, but the rib bones were a little more challenging. The were removed, but not as quickly or gracefully as the TV chef did hers. The charred tomato vinaigrette and the stuffing took some prep time, but were worth it for the flavor. I learned one lesson from charing the tomatoes. I thought I’d loosened the fond from the pan with a splash of water and add it to the blender. It turned my vinaigrette brown instead of pink like the original recipe’s. Ah, well, lessons learned. The experience with boning fish was a good lesson. I’ll be prepared if I ever want to stuff a fish again. the stuffing is bright and colorful and just might appear as a side dish one day. I will have to make the tomato vinaigrette again just to get the color right. FYI, I only prepared two trout and it was not difficult to halve the recipe. My chard-stuffed trout with an accidentally browned charred tomato vinaigrette. It was still delicious! Heat a large cast-iron pan or grill pan over high heat. Add tomato slices to pan; cook 6 minutes on each side until well charred. Place tomatoes in a blender. Add parsley, capers, ¼ cup olive oil, rosemary, juice, vinegar, garlic cloves, salt and pepper and blend until smooth. Heat a large non-stick skillet over medium-high heat. Add 1 Tbsp olive oil to pan. Add bell peppers, shallot, and sliced garlic cloves; sauté 4 minutes or until tender. Add chard; sauté 2 minutes or until chard is just wilted. Remove from heat, stir in chopped basil. Preheat oven to 400° F. Spread tomato mixture in a bottom of a 9X13 inch glass or ceramic baking dish. Sprinkle olives over mixture and arrange thyme sprigs over mixture. Sprinkle trout inside and out evenly with ¼ tsp. salt and1’2 tsp pepper. Place about ½ cup stuffing in each butterflied trout and fold halves back together. Reserve a little stuffing for garnish when plating. Heat remaining Tbsp olive oil in large non-stick pan. Add 2 stuffed trout to pan; cook 2 minutes or until skin is golden brown. Turn trout over and cook another 2 minutes until skin is golden brown. Place browned trout on mixture in baking dish. Repeat browning on remaining two stuffed fish. Place baking dish in oven and bake at 400° for 12 minutes until trout is just cooked through.